IN A SITUATION where material on environmental law is by and large scattered, the bringing together of case, statutory and analytical material, through careful selection and critique, is of significance to teachers and students of environmental law. The value of this book is greatly enhanced by the fact that besides case and statutory material, there are several articles that will introduce its readers to other books and articles, which they may not have cared to read for various reasons. Constitutional provisions and judicial remedies are followed by chapters on water and air pollution, forests and wildlife, urbanisation, dams, hazardous substances and a concluding special chapter on the Bhopal case. The enactments relevant to these issues are appended to the text. There are two ways of evaluating this book: in terms of the needs of environmental law teaching, and in terms of merit. So far as environmental law teaching is concerned, such books are necessary so that law teaching can relate itself quickly to larger and more basic developmental issues. The very nature of environmental law concerns forces one to dwell upon such issues. Much of legal pedagogy is, otherwise, bereft of basic developmental concerns. For these reasons, any text that helps in founding an environmental law course should be recommended. Considered on its own terms, the book has its advantages and shortcomings. As it takes a case study approach to the teaching of environmental law, students will certainly derive an understanding of judicial responses. 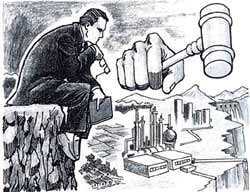 The shortcomings relate to the very understanding of environmental law. In the preface, Rosencranz recognises the fact that environmental issues in India are different from those in the West. Here, those who suffer from such problems are mostly the rural and tribal poor, for whom environmental rights violations are, by and large, human rights violations and include denial of their basic needs and means to livelihood. For the vast majority of Indians, therefore, the primary issues are of resource allocation, distribution and access, and only secondarily of pollution and exposure to hazardous substances. But such understanding is confined to the preface. When it comes to the exposition, the authors take a typical Western view of environmental law and concern themselves with hazardous substances and air and water pollution, and relegate all issues concerning allocation and access to basic need resources to the background. This also explains why issues concerning forests, on which are dependent the basic fuel, fodder and housing needs of the poor, receive the least attention in the book, a mere 12 pages, which, too, remain content with references to some mining cases. Pollution of water, degradation of land and loss of biodiversity are all effects, which will not disappear unless the causes are removed. Typical Western environmental law discourse confines itself to dealing with such effects, and this book is no exception. But environment law does not deal with symptomology. In a genuine environmental law context, and definitely in the context of India and the Third World, the causality of resource depletion or pollution must necessarily take primacy over the discussion of its symptoms. Although this book provides students with a good introduction to how symptoms are being treated legally, it will not give them any insight into the deeper labyrinth of the legal framework, which determines control over environmental resources and the possibility of their misuse. Consequently, it will not teach them anything about sustainable development or about creating an ecologically equitable society, which, to my view, should be the prime goal of any environmental law text.